Payzer is a mobile, all-in-one financial tool that helps contractors process cards, checks, and recurring payments with instant, paperless financing. Users can accept credit cards, debit cards, and electronic checks in the field or at the home office with real-time tracking across the organization. Payzer also enables instant credit, with financing of up to $55,000 using a mobile phone, tablet, or PC, as well as control over employee purchases by providing debit cards instead of a company credit card. Payzer aims to help businesses grow and increase sales by enabling them to take payments in the field using a mobile app, Payzer’s card reader, and online payment application. Users can also provide credit for their customers with instant on the spot approvals. Customers can apply for multiple promotional loan offers via mobile app, through the Payzer system, or directly through the business website. Payzer also allows users to set up recurring monthly payment plans for customers, with a secure virtual vault. Instead of company credit cards, organizations can issue Payzer debit purchasing cards to their employees and subcontractors to control and track purchases, and transfer any desired amount of money to their cards instantly. With Payzer, users can instantly make payments to other Payzer users, as well as make bill payments to anyone. The solution’s secure, cloud-based technology enables users to share and control information securely across the organization in real time. Administrative control features include user permissions, real-time purchase history and search, electronic invoice and statement distribution, email payment requests, and more. Fantastic payment processor. Better technology and customer service than the big banks! 1) Great mobile app. All of our residential technicians (HVAC, plumbing, electrical, appliances) use this to collect credit card payments in the field. 2) Great customer support - always a quick reply and resolution to any issues (which there are few of). 3) Very easy for back office to use. Previously, we used the product that our bank (a large, well-known one) offered us. It was very difficult for the office to manage what the field was collecting and the technology was very poor. With Payzer it's been so much easier. 4) Customization. Payzer has been very open to customizing the program to fit our needs. No complaints. Everything that we've had a problem with (which hasn't been much), we've taken to them and they've promptly handled. Payzer would like to thank you for being such a great partner from the very beginning. Your company and employees have been so easy to work with. We appreciate the kind review and we hope your business continues to grow along side us. Seriously, you guys are the best. Switching to Payzer was a piece of cake. We have had a very positive experience. The ease of use makes our jobs easier. We are able to close out and apply invoices so much faster. We are able to balance knowing what has been paid everyday. I am glad to be able to turn other processors away. Very happy with Payzer!The software is very user friendly making it easy to input cards, see payments, give credit etc. Our money is in the bank the next day . Our customers love being able to go on our site and make payments from home. Payzer has top notch customer service ! The software is very user friendly making it easy to input cards, see payments, give credit etc. Our money is in the bank the next day . Our customers love being able to go on our site and make payments from home. Payzer has top notch customer service ! Our techs seem to have issues swiping cards they mostly have to enter them manually. It would be nice if this worked better. Thank you for the review. Payzer would also like to thank you for being a valued partner of ours. As far as your techs having to manually enter cards, I'm very sorry to hear this. Payzer is always trying to improve our product and service. That being said, we have a solution and it's the new G4 card reader that launched about a year ago. The new readers have a re-chargeable battery, which means the reader will recognize a swipe on a more consistent basis. If you would like to discuss the card readers over the phone or via email, feel free to reach out. Our PayzerCare email is customercare@payzer.com and our phone number is 1.866.488.6525. My company is able to offer many more options for payment, which ultimately increases sales. 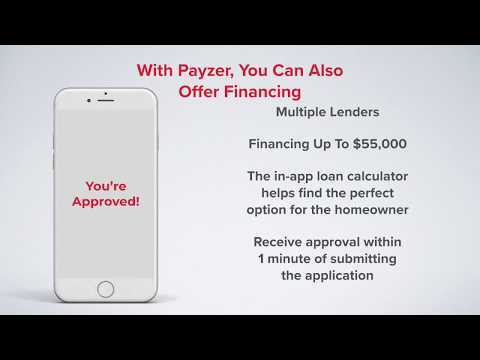 Payzer allows my sales team to close deals in the home, whether it be credit card processing or financing. Credit card processing and financing within the same dashboard lowers complexity and increases execution. I also like that Payzer retains all personal information so that I do not have the liability. Payzer allows my sales team to close deals in the home, whether it be credit card processing or financing. Credit card processing and financing within the same dashboard lowers complexity and increases execution. I also like that Payzer retains all personal information so that I do not have the liability. Not much, but I would like some additional financing options for clients with less than perfect credit. there are some at the moment, but a few more would not hurt. Thanks for your comment and kind review. If you're not already using Fortiva or Genesis, please let us know. They both do a great job of 2nd look lending and are helping our customers win more jobs today. We also have some new options planned for later in the year. Can we check back with you in Sept / Oct for an update? Feel free to call us or email us at payzercare@payzer.com if you have any questions or concerns. Email alerts and the financing dashboard are really useful the reporting is awesome too! customer rep and his team work hard for us. Doesn't work with Service Titan software. Card readers do not fit with an otterbox cover on the ipads. Payzer would like to thank you for the GREAT review and even better feedback. In regards to the card readers, we recommend you turning the card reader clockwise or counter clockwise while it's plugged in until you're able to push the reader further in. If this doesn't work, you can find some AUX extenders on the web. I'll past a link in here to an extender that we think is worthy of purchasing. If you have questions, give us a call. Hands down the easiest and most user friendly interface in credit card processing! We now have the ability to do monthly service agreements for our customers. This allows our customers to pay monthly and not have to pay one lump sum for their agreement. We also, have the ability for our sales force to receive deposits in the field now even before a job has started. The user interface is very easy to navigate and understand. The recurring payment options really allow us to charge monthly for our service agreements. This is somthing we have never been able to do until Payzer. The user interface is very easy to navigate and understand. The recurring payment options really allow us to charge monthly for our service agreements. This is somthing we have never been able to do until Payzer. I Wished that the software integrated with Quick books online. It does integrate with the desktop version, but not the online version. Thank you for the great review. We are pleased to hear everything is going well and we are working on integrating with Quickbooks Online. No hidden fees and completely free to sign up. • Improve collections by making payments easy with Payzer. Set up automatic recurring payment plans as well as instant, paperless consumer financing. • Get paid onsite or at the homeowner's location. Accept credit cards, debit cards, and electronic checks using Payzer's secure mobile app and card reader. • Send and track electronic invoices and receive customer payments from any mobile phone, tablet or PC. • Control purchases by providing employees with Visa Debit purchasing cards rather than a company credit card. • Provide instant financing up to $55,000 using any mobile phone, tablet, or PC instantly. Below are some frequently asked questions for Payzer. Q. What type of pricing plans does Payzer offer? Q. Who are the typical users of Payzer? Q. What languages does Payzer support? Q. Does Payzer support mobile devices? Q. Does Payzer offer an API? No, Payzer does not have an API available. Q. What other apps does Payzer integrate with? Q. What level of support does Payzer offer?